Which new issues from the company Lladró can we find for gifts and decoration in this summer? Lladro we still making us to fall in love with them, with their new creations and ideas. This time, they have elaborated a very useful porcelain figurine for gifts and decorations, for this time of year, where most of us have a few days of holidays at the beach. This porcelain figurine honors the surf, water sport consisting in sliding over the waves on a board. Surfing dates back to over 500 years in the Polynesian islands, but it was from the 1960s, when it began to be learned and practiced. The places with bigger boom of practitioners are Australia, the United States and southern Europe. The difficulty of this sport lies in the knowledge of being able to keep the balance, having in consideration the speed and the different forms of the waves. 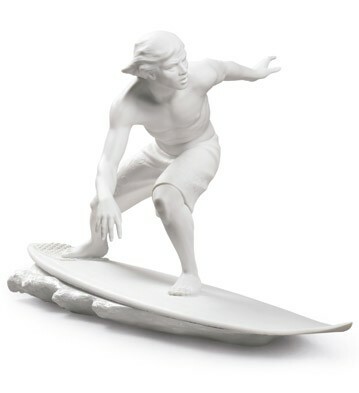 How is this new issue of Lladro porcelain of a surfer on a board? This figurine is biscuit porcelain in matte finish. Its dimensions are 41 cm long x 24 cm high. Its price is 375.00 euros, so as you can see, is not very high for the size of the piece. Remember that the biscuit is white porcelain, most often unglazed. The motive of this figurine is a surfer on a wave on a board in equilibrium position. As you can see the artists of Lladro do not leave any detail out of their minds and take into account even the movement of the hair to the wind. The reason for wanting to express such realism, in the movement and in the ways of the porcelain figurines is due to try to give to the porcelain figurine, a very common feature of pop art. The company Lladro tries to give to their new creations, a touch of all the new trends in decoration and new tastes and hobbies of the potencial customers. From my point of view, this porcelain figurine is a very nice and original gift for surfers. It is also a figurine that by virtue of their shape and color, are perfectly suited to today’s decors, where the faint light colors and have its peak. Similarly, as I have mentioned in other articles on this blog, these porcelain figurines can be perfectly adapted to the most traditional decorations, where the color of the furniture is dark. The white porcelain makes a wonderful contrast, full of light, to give contrast and elegance to this type of decoration.